Books of 2013 is a feature for highlighting speculative fiction books coming out in 2013 that appear particularly intriguing. 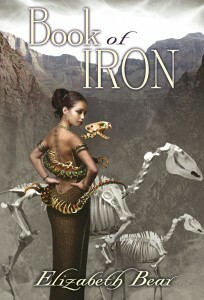 Book of Iron, a novella and prequel to Bone and Jewel Creatures, is scheduled for release on September 30, 2013. It’s set in the same world as Range of Ghosts and the rest of the upcoming Eternal Sky books (Shattered Pillars, the second of these, will be available next month). You can read a little more about the book on Elizabeth Bear’s blog. I love Elizabeth Bear’s writing, and I especially loved Range of Ghosts (so much that I will definitely be nominating it for a Hugo Award this year). This book sounded amazing, and once I saw it was set in the Eternal Sky world, it went right onto my wish list. Bijou the Artificer is a Wizard of Messaline, the City of Jackals. She and her partner–and rival–Kaulas the Necromancer, along with the martial Prince Salih, comprise the Bey’s elite band of trouble-solving adventurers.